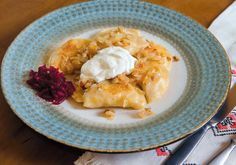 As summer wraps up, we point you in the direction of new restaurant openings, food truck soirees and wine tastings, and there is still time to sign up for a September triathlon (which should make up for the gorging you’ll be doing this month). It’s all about balance! 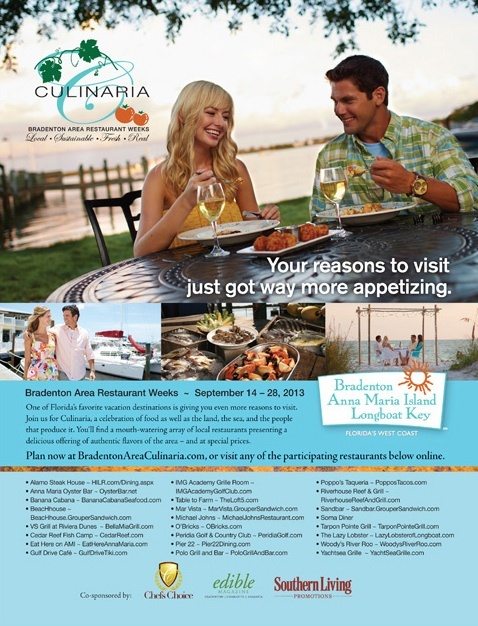 Here’s an excuse to explore Manatee County’s restaurants from September 14 to 28: “Culinaria!” Co-sponsored by Southern Living, Edible Sarasota and the Bradenton Area Convention and Visitor’s Bureau, the event will allow patrons to dine for $15 at lunch and $25 at dinner. There are also chances to win trips to New York City! 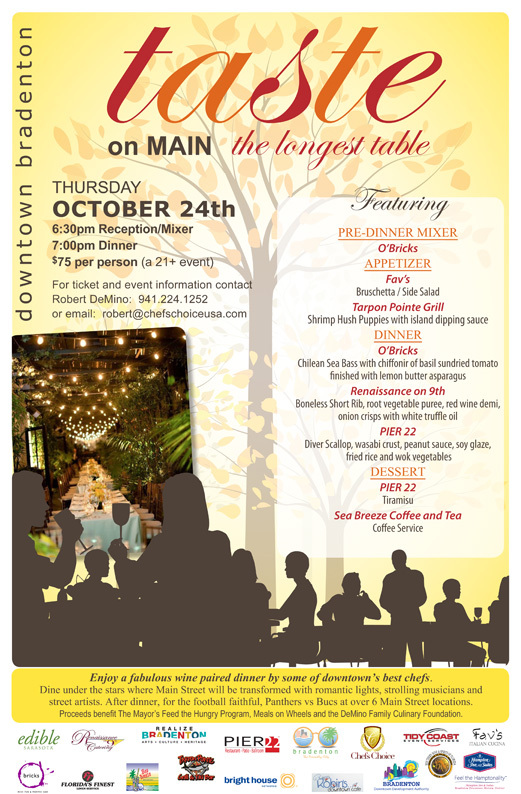 Find out how delectable downtown Bradenton can be at the inaugural “Taste on Main” at 6:30 p.m. Thurs. Oct. 24 along Main Street (from Manatee Avenue North to Fourth Avenue). 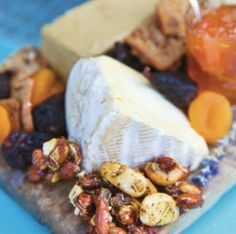 Chefs from six downtown restaurants, assisted by students in local culinary arts programs, will offer gourmet food and wine pairings. Eateries include Tarpon Pointe Grill, OBricks, Fav’s, Renaissance on 9th, Pier 22 and Seabreeze Coffee and Tea.Co-hosted by Edible Sarasota, Chefs Choice, the Bradenton Downtown Development Authority and Realize Bradenton, the event will donate a portion of its proceeds to helping future chefs acquire cooking tools. Info. 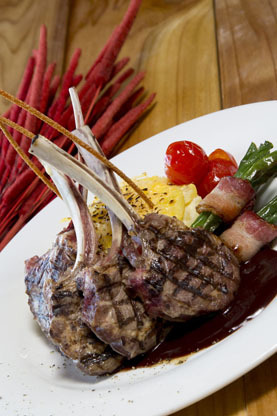 : Robert DeMino, business development coordinator, Chefs Choice, 941-224-1252;chefschoiceusa.com. 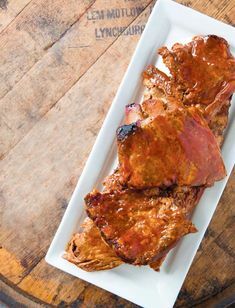 Fleming’s ribs will easily trump the ones you cooked on the home grill this summer, so let the pros do the work. Drop by on a Sunday for a specially priced three-course prime rib dinner (including salad and dessert) for $29.95, from now until September 1. Fill a large, straight-sided skillet with 1-inch of oil. Heat over medium heat to 375˚ or until a wooden spoon bubbles when inserted into oil. While oil is heating, combine okra and buttermilk in a large bowl. 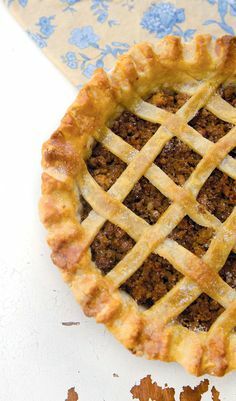 Combine cornmeal, flour, baking powder, salt, sugar, and pepper to taste in a separate large bowl. Working in batches, remove okra from buttermilk and dredge in cornmeal mixture, shaking off excess. Fry okra, in batches, until golden. Drain on paper towels. Heat grill to high. Lightly form hamburger into 4 patties, season both sides generously with salt and pepper. Make sure hamburger meat is at room temperature before grilling, this prevents shrinkage and helps maintain juiciness. Oil grill grates. Grill burgers, without pressing or flipping more than once, until cooked to you likeness; about 4 minutes per side for medium. 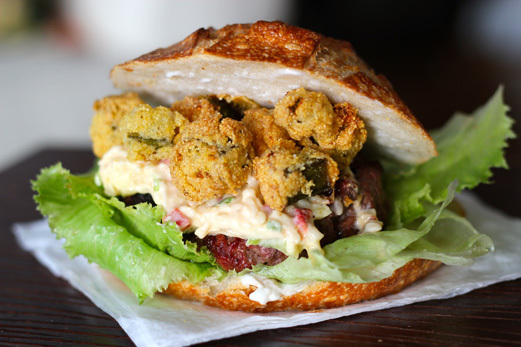 Top each burger with pimento cheese and fried okra and serve on a bun with mayonnaise and lettuce. NOTE: Fried okra and pimento cheese are two Southern staples. When piled on a perfectly grilled and juicy burger, they turn a backyard classic into the ultimate summer comfort food. Pimento cheese is easy to find at the grocery store, but it’s also a cinch to make-just blitz together cheddar cheese, mayo, pimento, and whatever spices you fancy and there you have it. We do! 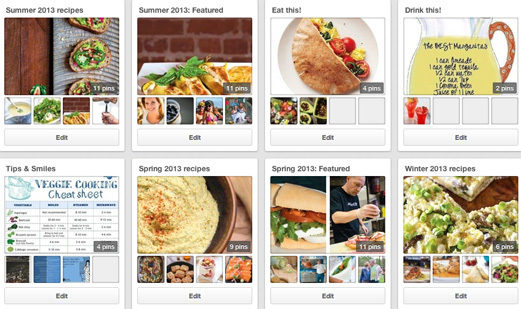 Check us out at pinterest.com/ediblesarasota for recipes, drink ideas and wine recommendations. Let’s get pinned. Everybody’s doing it. 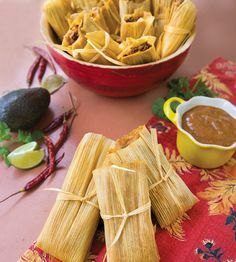 Did you know there was a Florida Cracker Week? Yep, from Mon. Aug. 19 to Sun. 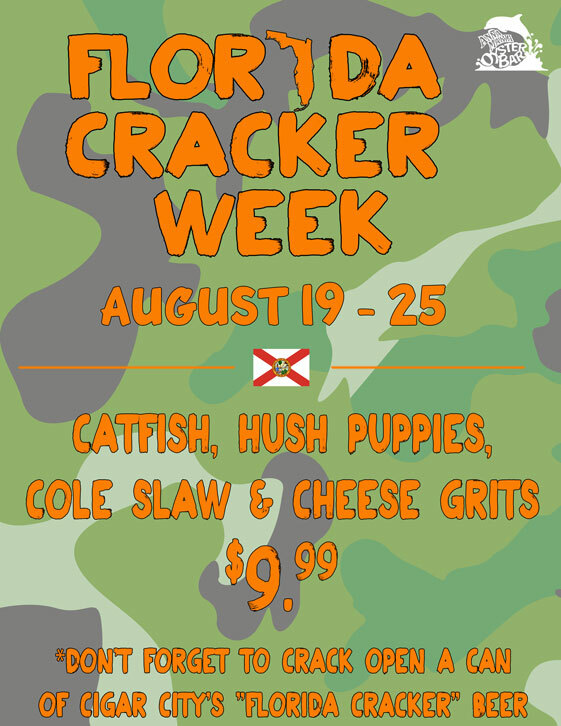 Aug. 25 at the Anna Maria Oyster Bar, celebrate with fried catfish, cheesy grits and hush puppies, as well as Florida Cracker White Ale from Cigar City Brewing in Tampa. Restaurateur Christian Zebier, former owner of Brasserie Belge, introduces Antoine’s Restaurant: a new Sarasota dinner destination with a continental, gourmet menu by chef Karl Deneubourg. 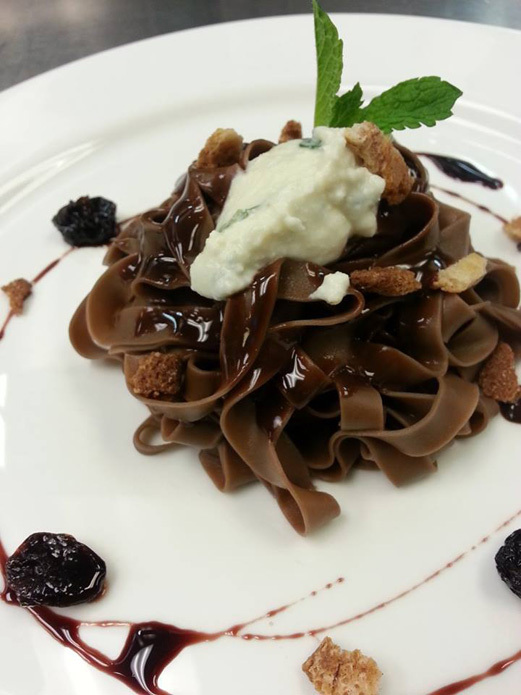 Think handmade pastas, ahi tuna steak, steak tartare, mussels, profiteroles, and imported wines and beers. Doors open at 4 p.m. Tuesday through Saturday. 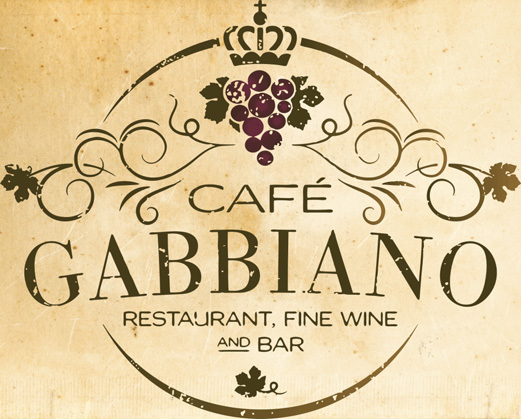 Experience complimentary wine tastings from 6:30 to 7:30 p.m. on the first Friday of every month at Cafe Gabbiano. Sample two reds and two white wines while wine experts share insights. Because it is during happy hour, appetizers are $5. Café Gabbiano: 5104 Ocean Boulevard, Sarasota, 941-349-1423; cafegabbiano.com. Javier’s Restaurant & Wine Bar was presented the Cordon d’ Or (Gold Ribbon) award for Casual Dining by the Florida Culinary Academy. The fifth Florida Culinary Academy Awards ceremony took place at the annual Small Farms Conference at the Heritage Center in Kissimmee, Florida on August 2nd. Javier’s was nominated for the award by Mitch Blumenthal of Global Organics. 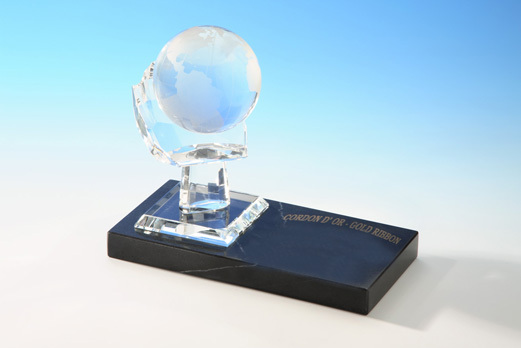 An award for Lifetime Achievement was presented to Global Organics at the conference. 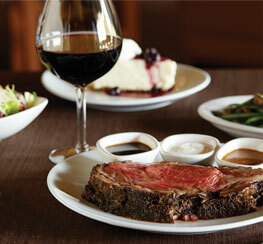 TheWineToBuy.com is teaming up with Chianti restaurant for a wine and food pairing from 6:30 to 8:30 p.m. Thurs. Aug. 22. 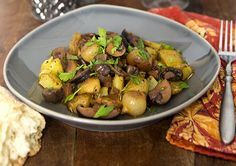 Savor pan-roasted striped bass with grilled baby octopus, marinated pork sirloin with wild mushroom stuffed zucchini packets, and chocolate fettuccini with basil mascarpone, along with high-quality vino and other delights. Limited to 12 people. Chianti Restaurant;3900 Clark Road, Sarasota, 941-952-3186;chiantisarasota.com. It’s not too late to test your competitive skills, reclaim your bod and bond with your pals at the Life’s a Beach Triathlon on Sat. Sept. 14 in Sarasota. 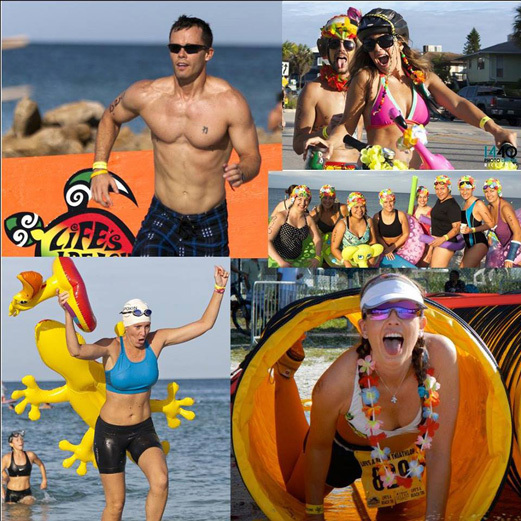 Run two miles, bike five miles on Lido Beach, swim 200 yards and maneuver in the sand under a net during the Turtle Crawl. Earn a race T-shirt, a cooler bag, a wristband and a goody bag. And don’t forget to sport your bikinis, board shorts and Hawaiian shirts. 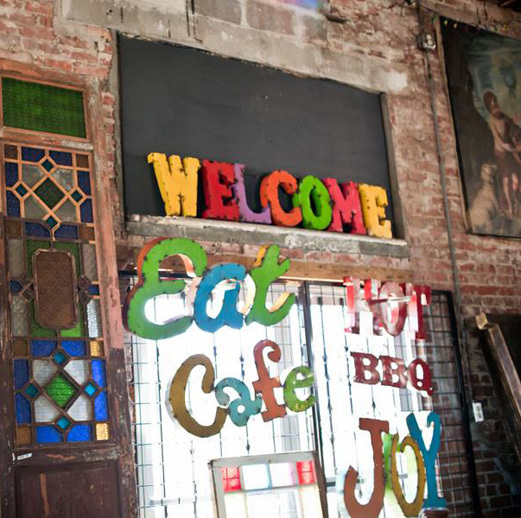 If you haven’t visited Circus City Architectural Salvage yet (it opened softly in mid-May), stop by the creative wonderland and say hi to our good friends! We are talking gorgeous wine racks made from recycled pallet wood, original chalkboards from 390 Design (see the winter issue of Edible), bistro tables, funky antiques and anything else a restaurateur or homeowner might crave. Need one-of-a-kind décor for your eatery or home kitchen? Check. 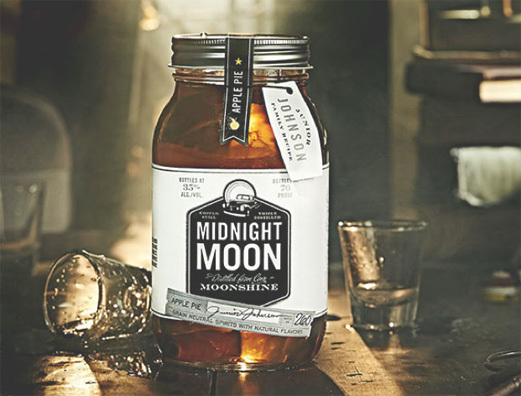 Earlier this month, a crate of moonshine arrived at our doorstep thanks to Becky, the rep for Junior Johnson’s Midnight Moon! She reached out to Edible and offered us a sample of this premium, small-batch, triple-distilled craft spirit from North Carolina. She must have picked up on our interest in the suddenly trendy liquor, which is slowly but surely finding its way onto Sarasota-Bradenton’s bar shelves (check the website for the updated list of local purveyors). Now we are in love with the blackberry, cranberry, blueberry and cherry flavors. 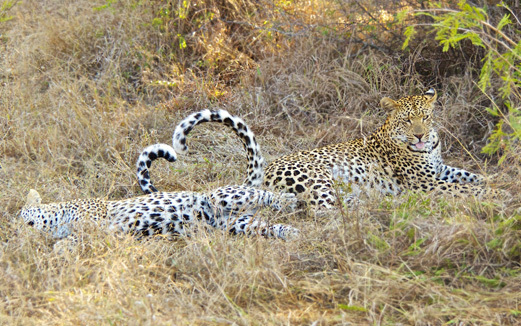 No synthetics. No fillers. Just infused fruits and home-style goodness. “Dear Abby” seal of approval, for sure. Revive Productions and Drematik Statik present “Neon Circus,” a three-day extravaganza in Gulf Gate from Fri. Sept. 27 to Sun. Sept. 29 with five stages, 25-plus DJs, graffiti artists and circus acts. Friday is the 9 p.m. kick-off party at Evie’s Tavern on Ringling. Saturday is the main event along Gateway Avenue, with stages outside Piatti, Sarasota Gone Ugly and Chester’s Reef. Sunday is a rehab party (specifics to be announced). Find full details on the website and get ready to rally. 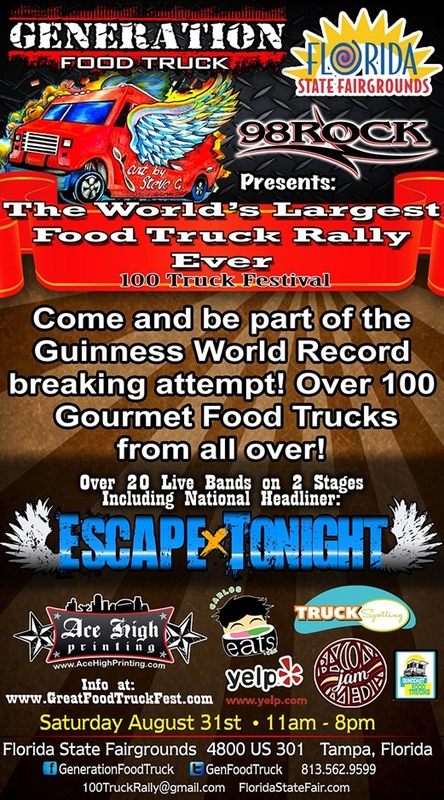 Help break a Guinness World Record by attending the world’s largest food truck rally from 11 a.m. to 8 p.m. Sat. Aug. 31 in Tampa. Presented by 98 Rock and Generation Food Truck, the blowout will feature more than 100 gourmet food trucks, and 20-plus bands on two stages (including national headliner Escape Tonight).